Our 2.5 year-old American Pit Bull Terrier was recently in heat. However, instead of the usual full-month cycle, her cycle only lasted barely two weeks. Has anyone ever heard of this? The hubby has raised dogs for years and says he's never seen it. We already plan to get her spayed as soon as we can get a couple of bills paid off. 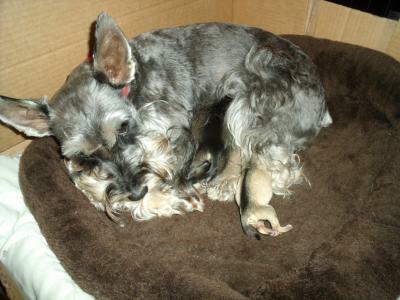 My female Schnauzers only go into heat lasting about 2 weeks. And they only come into heat approximately every 6 months. That is pretty much normal. Good luck! Thanks, I feel better now. I would've suspected she might be preggers, except we kept her sequestered. Her first heat was at 9 months, and that appears to be the "inactive" period's length as well. Which means we should have until November or December to get her spayed.